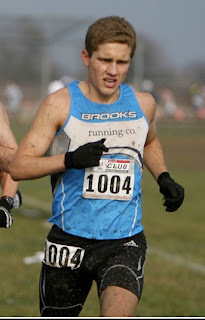 I went out to Ohio this weekend with a couple of teammates to run the USATF Cross Country Club Nationals (10K). 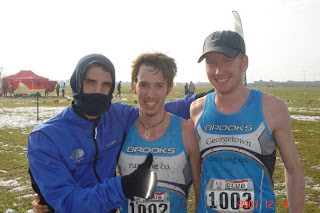 Unfortunately we did not field a full team as one of our runners fell ill late last week, but we had four determined guys and decided to make a weekend out of it. The road trip alone was epic. When we arrived on Friday night the ground was covered in 2" of snow, overnight the temperature climbed and it started to pour so the next day the course was a quagmire. The course was composed of three 2-mile loops that rolled around a large cornfield of sorts. The entire field and trails were a mess and we were the last race so the course was only going to get more nasty after thousands of spiked feet tramped across it. We're talking shin deep puddles and ankle deep muck that sucked at your spikes. The water was ice cold and filled with brown snowy slush. The "drier" sections of the course were simply strips of slick muddy grass. It was mostly flat but there were a few low spots where the water collected and traction was nearly impossible. There were also hay bales that runners had to steeple/hurdle on parts of the course. The gun sounded and the 400 or so runners funneled towards the 20ft wide towpath. I've run 8 years of cross country but never experienced a stampede so fast and furious. In an instant you were soaked with mud...not just your legs but also your waist. Cold mucky water was thrown onto my face while spiked shoes slammed the ground all around me. Mud was everywhere...even the eyelids. I was in the middle of the pack and running straight through giant puddles. I looked around for an opening and finally found one. I didn't see any of my teammates or anyone from the Pacers (rival DC-area running team) near me. I tried to find the high/dry ground but it proved impossible. There was shoving and pushing as the giant mass of runners curved right towards the first mile. I hit the mile in a wall of people in 5:09. It felt like 4:39. I felt uncomfortable and really wanted to get away from all the people and start to run, but everyone was either weaving around puddles of simply pushing right through the slop. I hadn't realized how crowded it would be so I said to myself "just hang on and don't let too many people pass you". Two miles was hit in 10:36 but the crowd hadn't thinned out. I was already very tired from trying to race through puddles and dreaded the fact I still had 4+ miles to go. I felt like a slowed down and it seemed like a lot people started to pass me. I was feeling pretty down but finally something "clicked" and I said to myself "enough, it's time to race". After 5k I began to get back into it. I was tired but in a weird way I still felt strong. It was impossible to run hard in these conditions so in a way I was only running 80%. I crowd had thinned a little (instead of 40 people to my left and right there were only 10-15) and I started to look for "dry" ground. At times this was impossible and everyone was forced to wade through slop which totally killed any rhythm. I would pass people in the puddles as I ran through the thick muck, then they would pass me back doing the same thing. At mile 4, Pacer Brian Baillie pulled up along side me and began to pull away. At this point I was starting to pass people and gave chase to anyone who passed me. Baillie was no exception. I made an extra effort to push on and keep him behind me. I knew there was only 10 mins to go so I just kept pushing and trying to find dry spots. I hit mile 5 in 27:45 and did a double take at my watch. I picked off more people in the last mile and made an attempt to kick during the final straight away, but I was exhausted and didn't gain much momentum. I ended up in 119th place with a time of 34:29. Obviously times went out the window in a race like this (winner was just under 32 mins). I guess I walked away happy. I beat a few Olympic Trials qualifiers and some other "known names" I hadn't beaten before so I think I had a better day than some others. Pat - how do you keep your hair so nice while you race? I just took a couple of handfuls of the mud and ice flying in my face at the race start and rubbed it in. Nevermind mud holes, surging rivals, hay barrels, or anything else we had to negotiate--a guy's gotta look good, you know?